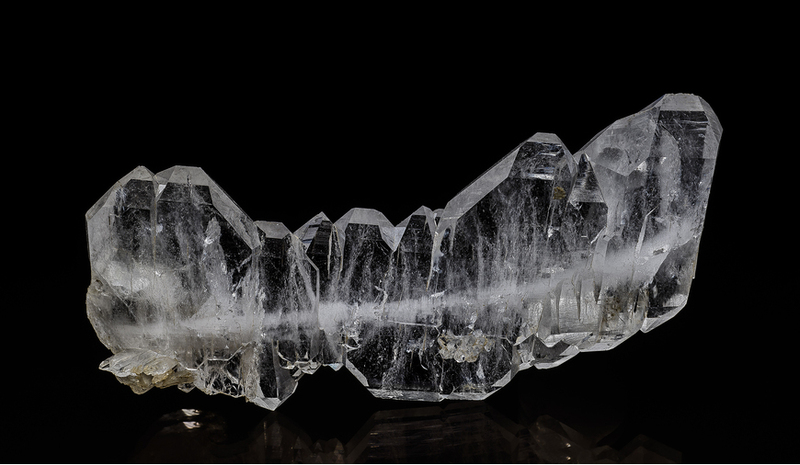 Faden Quartz: Mineral information, data and localities. From "Faden", German for "thread". Pronounced "fah-den". 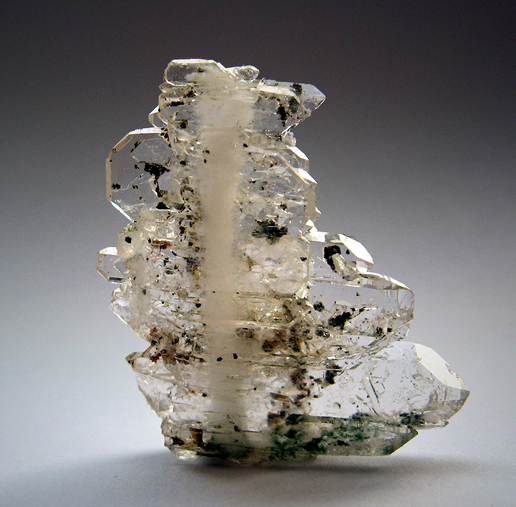 "Faden quartz" is the anglicized version of the German "Fadenquarz". "Faden" (pronounced "fah-den") means "thread" and refers to a white line that runs through the crystal. Faden quartz forms in fissures in the host rock that widen slowly and steadily. Quartz crystals inside the host rock will rupture when the fissure opens. In a silica rich solution, this rupture will heal quickly, forming a crystal that is attached to the opposing rock walls and bridges the new opening. While the fissure continues to open steadily, the crystal will also continue to crack and heal. Because growth is much quicker on fractured surfaces than on regular faces and because it leads to small regular faces on the opposite conchoidal fracture surfaces that do not perfectly match, some of the growth solution is included in the crystal. The repeated rupturing and healing leaves a scar of liquid and gas inclusions in the crystal: a white thread, the "faden". 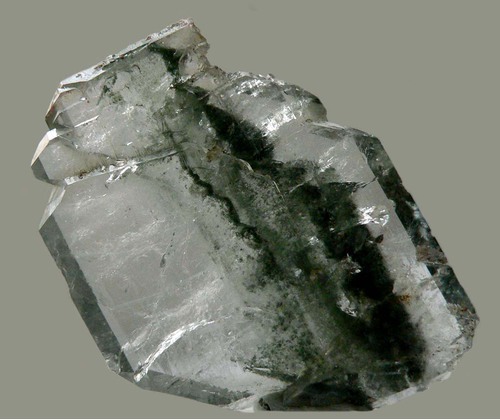 In rare cases, the faden is covered by chlorite, which demonstrates beautifully that a now platy specimen did indeed start as a thin thread (see third head photo). The thread can be seen best in crystals that grew parallel to the wall, because the speed of growth is usually larger along the crystals c-axis (from tip to tip). These faden quartzes usually assume a platy shape. Faden quartz crystals that grew perpendicular to the walls, so that the tips point to the rock wall, do not get platy. The thread is usually straight, but depending on the movement of the opposing rock walls, may also be curved, jagged or interrupted. Faden quartz occurs in extension fissures in different environments, most commonly in Alpine-type fissures. They often form curtain-like groups of intergrown crystals. Lemmlein, G.G. (1946) Über die Entstehung flacher Kristalle mit «weissen Streifen». Fragen der Mineralogie, Geochemie und Petrographie, herausgegeben von der Akademie der Naturwissenschaften der UdSSR. Translated from Russian by B. Stalder-Scherrer (1969) in: Schweizer Strahler: 2: 430-440. Richards, R.P. (1990) The Origin of Faden Quartz. Mineralogical Record: 21: 191-201. Rykart, R. (1995) Quarz-Monographie - Die Eigenheiten von Bergkristall, Rauchquarz, Amethyst, Chalcedon, Achat, Opal und anderen Varietäten. Ott-Verlag, Thun.